Life is like a menu at a restaurant. You find the familiar, the enticing, the predictable and the completely bland. While you peruse the menu you eventually have to make a choice and then place an order. The choices we make are like tossing a coin in the air. You can only hope for the side you want to land face up. You are not in total control of what side lands up or down. This uncertainty influences people to choose wisely or foolishly. Yeah, it depends on how they process situations. So below are 7 choices you might plan on making today or are already making that will definitely not favour your chances at fulfilment/happiness (you take your pick) in the future. We see things differently; therefore we process them differently. Your opinion will definitely be different from another person’s. However, You must be confident enough to view and process issues independently. Some people can’t make decisions until nearly everyone in their lives have approved of it. When you’re faced with choices, ask yourself “what do I think?” and not what do people think? 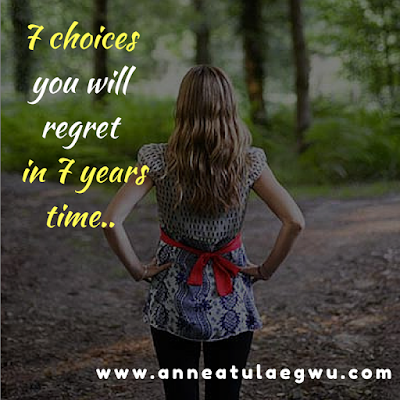 If you keep making choices based on what other people thought, You most likely would have made regrettable choices in the next 7 years. Ever heard the world people pleasers? Pleasing people or getting them to feel comfortable around you is great but honey, not to the detriment of your dreams. Some people have spent years at the university studying courses totally opposite to their dreams because they want to please their parents. Others have given up their dreams to please a spouse. Irrespective of how logical that choice may seem at the moment, it’s bound to evoke regrets years down the line. So you hope that someday, someone will invite you to speak at their conference and yet you’ve never even began to research what aspect of life you will like to become a speaker on. Waiting passively for opportunities to roll by, leaves you lame when the opportunities arrive. If there is something you wish for, prepare like you already know when and how it will happen. Do the opposite and regret will be inevitable. I’m not the place-yourself-on-an-eternally-high, unreachable pedestal thinking-person but I definitely believe in reaching for the highest possible quality you desire. So if you know you’re worth better, why pack your bag at your current “location” in life? If you decide to “manage” what life throws at you without making distinct plans or taking clear steps towards what you deserve or desire, you will definitely regret your laid back approach in years to come. You know how tempting it is for you to “play along” because you are afraid of losing someone or something you love? Inasmuch as that might seem okay at the moment, it’s only a matter of time before those people see you for whom you truly are and they will resent you. Don’t try to be someone you are not because you want to get other people to stay with you. No matter the situation, being true to who you are is more honourable than wearing masks around in pretence. 7. The choice to follow your heart care freely. Inasmuch as we gain some sense of satisfaction when we give ourselves what our hearts desire, it is unadvisable to follow your heart care freely. The heart can’t tell what’s totally right or wrong we have to train/condition it into what we want. If you do everything your heart desires care freely, you would most likely kill your boss or that friend who snatched your boyfriend. Now how would you feel after you’ve killed them? I bet not as good as you envisaged. You see my love, time has a way of placing things in correct perspective. What appears extremely urgent and pressingly important today, may mean absolutely nothing or worthless in 7 years time. Get the drift? So rather than act as your heart detects, measure every desire against scripture because in the end, way beyond those 7 years in front, what we thought was right won’t negate what God's standard of right is. Hey ladies! Tamar's Pouch conference is 30 days away. I'll like to meet with you. Click for details or Register Here. The 5 most important questions to ask yourself everyday!